This page will tell you everything you need to know about the ICB exams 2018. You know that at Together We Pass we believe in helping students, and so this page here to bring you all the information you need to help you with the ICB, and your ICB exams. I would like to first explain how ICB courses are graded. It is very simple. 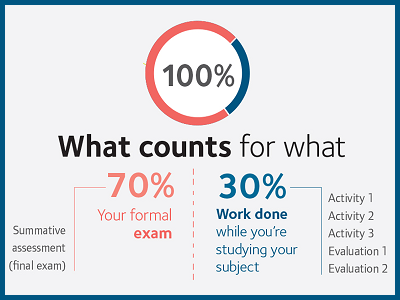 30% of your final mark comes from the activities and evaluations you undertake during your course. You will be given your Portfolio of Evidence (PoE) folder once you’ve registered for an assessment with the ICB. You should receive this at least 2 weeks before the exam. You then take this with you on the day of the exam, and your PoE is complete when your final assessment is added to it at the end of your course. Your final exam will count for the remaining 70% of your mark. You will need to include it in your PoE, which an ICB-registered assessor will then check to see whether or not you have passed. Remember that you need to get 50% on your final exam to pass. This is regardless of any marks you get from your coursework. If you don’t get 50% or above in the final exam you will fail the subject. This means you need to be really prepared and have practiced in exam settings prior to taking the final exam. This means that you cannot slack with your activities and evaluations during your studies, as they fully prepare you for the final assessment, and also provide evidence of the hard work you’ve. What Is The ICB Pass Mark? In order to pass your ICB exams, you will need to get 60% of the overall course. When And Where Are My ICB Exams? The ICB has many centres around the country and abroad where you can register to write your ICB exams. These ICB exams are held at ICB-approved assessment centres around southern Africa. Our friendly staff will help you find a venue and explain how to book closer to the time. You can only be assessed if you have paid your annual ICB student registration fee. Make sure that you double check the ICB Assessment Policies & Procedures before you start completing your PoE, as these are updated from time to time. What Happens If I Need To Postpone An Assessment? Should you need to delay your ICB exams then you will need to check the Assessment Timetables to see when you need to submit postponements by and pay a postponement fee. There are cut-offs for these for each assessment cycle so make sure you request a postponement in time. If you need to postpone your assessment because you’re ill on the day, you can apply for a free postponement (include a doctor’s certificate with your request), which may be issued at the ICB’s discretion. Assessment of subjects can be postponed once only if we have received your postponement fee in time. Download the ICB Assessment Policy to learn more. You can also read more about ICB re-assessments on this page here. What Happens If I Do Not Pass My ICB Exam? If you don’t pass the first time, please don’t worry. You are allowed one re-assessment, where you must get 60% to pass. You must do this within 12 months of your original summative assessment date. We do recommend that re-assessments are written as soon as possible, as subject content will change and it’s your responsibility to make sure you are aware of what’s changed.